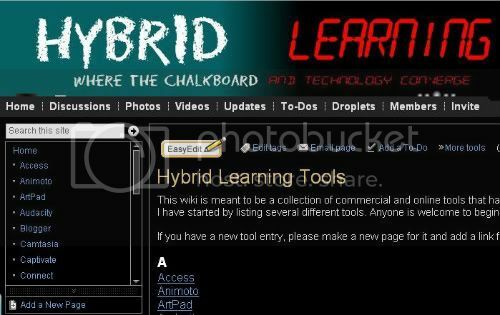 I am launching a new wiki that is meant to collect thoughts on various educational tools. Share what you think are the pros and cons of the tool and share some ideas for how you use it in the classroom. Help create this potentially very useful repository. Are we providing our students with useful information? How many of our students wander the halls each day with similar thoughts in their head? How many times have we heard them ask “When are we ever going to use this?” or “Why is this important?” Do we always have an answer? Do we always have a good answer? I have heard this question a number of times and I have often pondered on it without being asked but I am afraid that I have yet to come to a solid conclusion. Now don’t get me wrong, I love my subject area very much; I find it very interesting, very meaningful, and I love to share the knowledge with students. While this makes the information very useful to me, it does not mean that the information is useful or interesting to everyone else. I simply need to come to grips with that reality. Since our students come from many backgrounds with a wide range of experiences and aspirations it does seem reasonable to say that what we teach may be useful to some and worthless to others and while I understand that some of what we teach our students is universally critical to achieving success in the nation today, I also know that some of it is not. This is not an easy thing to swallow, especially when we are talking about the topics we each feel so passionately about that we decided to share it with thousands of students we will no doubt see throughout our careers as teachers. It hurts to know that maybe they don’t care about the same things. So how much of our student’s valuable time is wasted in classes that do not provide them with the tools and information that is useful to them? State requirements for graduation with a high school diploma varies from state to state but I wonder how many of the additional credits that students need to graduate from high schools around the country come from courses that are useful or interesting to the lives of the students who take our classes? I realize that the idea of usefulness is relative, which makes me wonder if changing a teaching style, differentiating instruction, making more hands-on activities, or implementing any of the latest teaching techniques will truly have the desired impact on students that we are looking for. A common goal among many schools is the development of responsible citizens and life-long learners. Are we discouraging this by forcing material on them that they feel is neither personally interesting nor useful to their future plans? I posit that life-long learners would be easier to create if they were always engaged in learning that was useful or interesting to them during their four years of high school. I posit that responsible citizens are formed through a combination of things such as providing a safe environment to learn, showing genuine care for them, helping them to make continuous improvements no matter how small, giving constant encouragement, creating notable experiences and value, making connections to the real world, and keeping them engaged. It would be just as foolish of me to think that 100% of our students will be fully engaged for four whole years solely in classes they find useful or interesting as it was for President Bush to think that No Child Left Behind might actually work but maybe we can make some positive gains by taking a more critical look at how we do business. I love the idea of well rounded students but exactly how well rounded are they after a few short years out of high school? There are so many ideas here that warrant a discussion - please tell me what you might be thinking. How do we transform the way we educate our nation's children into something that is relevant, engaging, and effective in order to produce high quality citizens who are able to function effectively and are capable of meeting the needs of our country in the years to come? How are you using your wiki? I started thinking about the wiki and the collaborative possibilities that it really has. I think we have all seen the power of the wiki from the size and success of Wikipedia. The question is... how can we harness the power of the wiki for our classrooms? Here are just a few ideas that come to mind and I know that there are so many more. Have students 'write' the textbook for your course based on your daily lessons over the duration of the course. Have students deposit thoughts for group projects and agree on a final deliverable. Have students gather information from as many outside sources as possible. Have students contribute to a fun way of connecting content to everyday relevant things. Have students collect notes for absent students into the wiki. To expand on number 4 just a bit further... I stumbled upon this idea one day about a month ago or so with my meteorology students. Somehow we got to talking about a particular song that made some references to the weather in it. It dawned on me that there were an awful lot of songs with weather and climate references in them. I decided to create a wiki and encouraged the students to add songs and artists to the wiki as they thought of them to see how big of a list we could get by the end of the semester. Periodically I will take a few minutes and play one from the list. People really connect to music and I thought this was just one way that students could get excited about what we are learning. These ideas are just a tip to the iceberg. What types of activities do you have your students do using a wiki? What wiki site do you use?